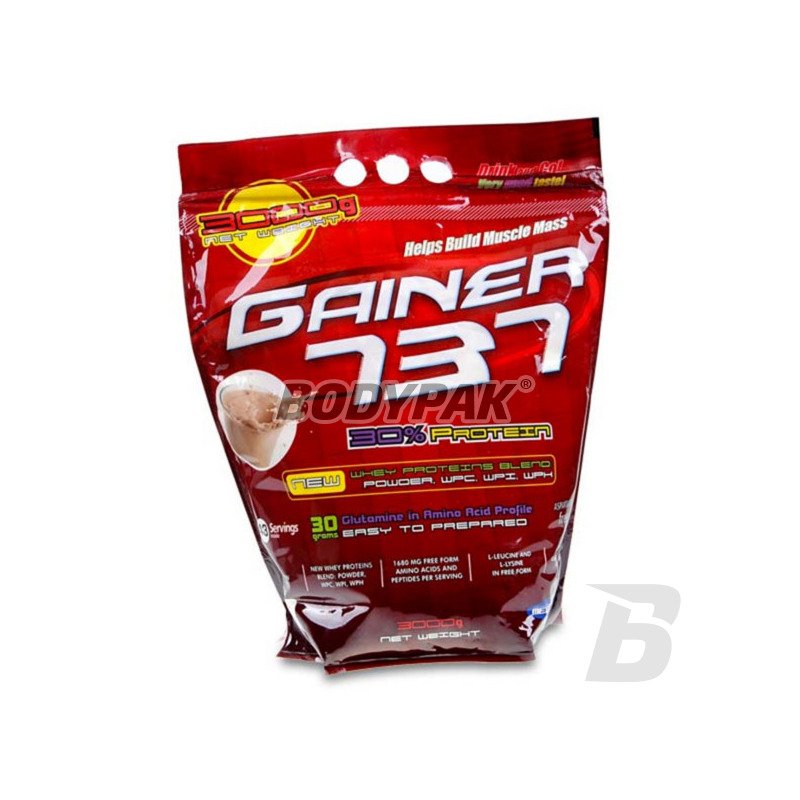 Gainer 737 is the result of many months of work to design a product with a wholesome aminogram, fully digestible and optimally used by the athlete's body and at the same time affordable. Megabol Gainer 737 - Preparation class 'gainer' with increased protein content (30%). The most recent studies on sports nutrition recommend just such a protein in preparations of protein and carbohydrate. If you are looking for this type of nutrients and not you dysonujesz huge amount of cash - it will be the best possible choice! HIGH CONCENTRATION OF PROTEIN ORIGINAL TASTE AND SOLUBILITY. Megabol Gainer 737 - is the result of many months of work to design a product with a wholesome aminogram, fully digestible and optimally used by the athlete's body and at the same time affordable. - 30% of protein from whey, wheat germ and 90% hydrolyzed animal collagen. This kit provides a universal amino acid profile of high biological value. This composition aminogram provides access to the amino acid quantitatively and structurally adjusted to the needs revised as a result of physical training. - Optimum selection of complex carbohydrates simple and complex aims to influence energy as long as possible on the body. Carbohydrates provide energy simple- szybkowchłanialne immediately after eating, while wolnowchłanialne, long-term uwalnianiają energy components. - High content of glutamine (glutamic acid 30 g / 100 g protein). Glutamine is an essential amino acid political system. Nitrogen is the Transporter in the gastrointestinal tract and a precursor of the metabolic valid user (arginine, glutathione, taurine). It accelerates regeneration of muscle tissue. - A full set of vitamins (E, C, B1, B2, PP, B6, B12, folacin, biotin, pantothenic acid) provides supplement their deficiencies, which often occur with systematic, intensive training. - Amino acids in free form and peptide. The amino acids in this form are known to all bodybuilders as a popular supplement. Adding nutrients to aminokasów shortens the time of their availability (before obtaining the cleavage of a long process of proteins). In addition to the basic function of building materials have a protective function as a component of regulators metabolicznych- enzymes and functional proteins (transport, immune receptors). It is the ideal preparation for all who eat too little, considering the load of training and the need to increase body weight. Scientific publications according to indicate that the body without providing excess energy and high amounts of protein (2 g / kg) can not be enlarged weight. Even the best conditioner does not work, if it is used in small amounts. The demand for protein persons Training bodybuilding is 4 times higher than the average trainee is not human. In addition, for sports increased (on average by 40-60%), demand for energy and wanting to increase the weight you need to provide the meals more energy than it consumes. Such a significant increase in the amount of daily food is usually very troublesome, often this treatment comes down to the consumption of large quantities of basic food products (milk, dairy products), sometimes 'forced'. GAINER 737 ™ is a product that provides all the necessary components more easily and at lower cost than the additional meals. Besides eating tasty sheikh is simply more fun. Why Gainer 737 costs less than similar formulations of other companies? Good information! For several years, prices nutrients constantly falling. Many years of experience in ordering costs, access to the direct producers of raw materials and, above all, to the most efficient technologies, reduce costs and allow use 'dumping' prices. Ingredients: complex Whey 737 (dried whey, whey protein concentrate WPC whey protein isolate WPI hydrolysed whey protein CCP), protein wheat germ maltodextrin, a complex of the peptide amino acid 737 (hydrolysed collagen protein hydrolysed whey proteins l-leucine, l-lysine), aroma (taste on the package), vitamins (l-aspartic acid [vitamin C] , nicotinamide [niacin], D-alpha-tocopherol [vitamin E], D-calcium pantothenate [pantothenic acid], riboflavin [vitamin B2] pyridoxine hydrochloride [B6] thiamine hydrochloride [vitamin B1] l-metylofolian calcium [ folate], D-biotin [biotin], cyanocobalamin [vitamin B12], dye E129 for strawberry and raspberry. Zero masy w plusie,może jak by pić go 4 razy dziennie ,ale niestety zamula i długo się trawi. 3kg zjedzone. Uczucie mieszane bardzo ciężko się trawi. Smak beznadziejny, przyrosty znikome lecz siły odrobine więcej. Koncze wlasnie drugi worek;) smak biszkopt wanilia z mlekiem dobry nie ma do czego sie przyczepic w tej cenie rewelacja. Stosuje miesiąc, smak cappuccino fatalny ciężko było przełknąć na początku aczkolwiek 3kg do przodu. Chcesz taniego gainera to kupuj. Ogólnie nie polecam tego produktu ze względu na białka zawarte w składzie tego gainera, gdyż są bezużyteczne. Jedynie co opowiada się na plus, to to że zaspokaja potrzeby energetyczne. Przy tym smaki są beznadziejne. Sami rozważcie czy nie warto zapłacić nieco więcej na rzecz dobrego produktu. 8 osób uznało tą opinię za pomocną. Formula that increases muscle mass and strength. It provides 1,250 calories and 50g nutritious protein in every serving! Additionally, conditioner has been enriched with minerals and vitamins! Reach for the mass! If you have trouble gaining weight and diet is not your forte - this product is perfect for you. The thought goes hand in hand high calorie, so you provide the body with adequate amounts of nutrients has never been so easy! 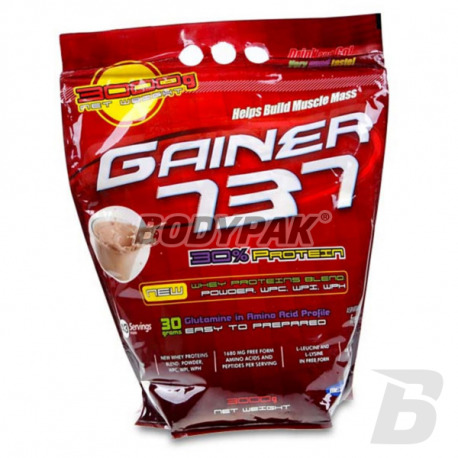 Advanced gainer contains a complex of long-chained carbohydrates and the highest-quality whey protein. It is a product designed for your needs - fill in the diet and enjoy fast weight increments! Profi Mass ensures optimum absorption of sugars and amino acids to the intensely working muscle cells, which is crucial in achieving success in any sport. The effective mass of the conditioner, through which gaps will complete carbohydrates, proteins and fats in their diet. The high calorific value additionally supports appropriate balance diet! Refined taste and solubility of each serving. High-quality carbohydrates and protein! Bid on the mass of a balanced amount of proteins and carbohydrates, making it easy I will complete your diet lacks weight. It contains a number of Works has additives such as vitamins, minerals, L-carnitine and an extract of Garcinia Cambogia HCA is the source. Refined taste and solubility! High-quality conditioner on weight! The product is supplemented with wheat protein concentrate. The product is designed to assist athletes lean on a fast metabolism during the building body mass and muscle strength. Conditioner supporting muscle mass gain "BULK", in which the ratio of protein to carbohydrates is 50%: 50%. Only animal protein and high-carbohydrate - the product ideal as a meal replacement, and to enrich the diet!